First of all, plot. Our hero is a character by the name of MacKillop; male and tending towards action before thought. More than this I cannot say for certain, and you’ll find out why below. 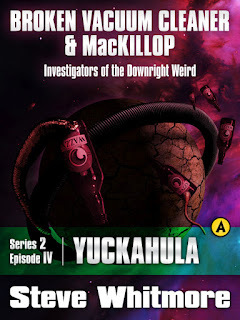 His sidekick, a non-functioning Nippy De-luxe™ vacuum cleaner, called Broken Vacuum Cleaner, or BVC for short, a well-informed repository of caution and opinion, is carried around in a knapsack on MacKillop’s back. And they have just jumped feet-first into a brand new evil-busting adventure, battling alien slugs in a corner of an unnamed town in Blighty. From remembrances of past adventures, we learn that these two fight the wrong, the weird, and the downright demonic. These alien slugs seem to have a pseudopod in each of those camps, as they desiccate their victims by drinking every last scrap of fluid in a body. And they are mostly invisible. At least, they are until they don’t mind being seen: the finale takes place in a pub (oh, how British), the final extra-terrestrial slug attached to a youngster’s face in full view of his gang, drinking every drop of beer in the place. Who knew space had alcoholic thugs? I say ‘jumped in’ because it reads, clearly and frankly, like Quantum Leap gone decidedly odd in the head. Instead of a holographic side-kick with a computer of clues to hand, our hero has BVC, but he is still leaping right into another’s body for the duration of whatever it is he and BVC (Broken Vacuum Cleaner) have to solve. And these are definitely missions, or MYSTERIES; as they are to MacKillop and BVC. And they’ve done this before; having travelled together for “long millennia”, during which time there is no warning of when and where they will go next; “every time they just arrived, had to do the best they could.” Sometimes, we are told, the body MacKillop inhabited for an adventure would die, fallen to age or injury, before the MYSTERIE is solved. BVC, though, remains implacably a vacuum cleaner in a knapsack, which is also called MYSTERIE, according to writing stencilled on its side. So these two are caught in a loop of events over which they have no control, although there does seem to be a cause; a place of origin for the ‘leaping’ process, but one to which there is no access; “the greatest conundrum of them all … who had scribbled those words on the knapsack? ... now came the sting of disinfectant, the barely audible hum, the first signs of what he and BVC called ‘back.’” Again, like Quantum Leap, there is a desperate hope in there that the next leap will be ‘the leap home’, although the sardonic voice of MacKillop doesn’t suggest he believes it is happening any time soon. This has happened over and over again for him, and now he just waits for “the weirdness” to “kick off” so he can get on and do whatever he has to do. And there you have it. In there is the big joke that Whitmore is having with us. Put simply, then; although the title suggests that this is some way along a series of stories: “series 2, part IV”, and it presents with self-contained half-explained references one might expect from an ongoing series, this is in fact the first story about these characters, and the first from Whitmore. Is this a Star Wars homage; which started with Episode IV? Or is this a cheeky trick to drag all of us; reader, characters, and the author’s mind, right into the middle of the action from the get-go without all of that tedious ‘here’s how we get to the good stuff’ back-story and scene setting? Either way, it’s a very good wheeze. I was hooked, and although a couple of readings were needed to get my head around those references I mentioned, at just sixteen pages long, that was no great brain-ache to accomplish. And the vim and verve of the style meant I didn’t mind bouncing through it more than once. In order for such referencing to work, one normally needs a pre-primed set of values, shared by the reader and the text, in order create a short-hand in explaining familiar issues. Well, this is the first book, so it has to both reference to give a sense of inclusion, but also explain just enough to make sense of that reference. In order to accomplish this, Whitmore has kept his plot basic, his dialogue snappy and the number of such references low. Thus he succeeds. In order, then, we have the entire premise of continued body-shifting adventures, starting with a description of the materialisation process, something familiar but loathed for its nausea-inducing properties. Then there are the stencilled words on the knapsack; MYSTERIE and the naming of the trans-dimensional antics as the MYSTERIES to be solved. That word means something to MacKillop, but he cannot remember what. The sense of searching for something; answers to questions, specifically ‘what the heck am I doing, rocketing about like this?’ I paraphrase, but it’s in there, among the hero’s motives. And to appease Health and safety, BVC has his PPSE safety checking acronym: the process he reminds MacKillop to apply so he doesn’t go charging in and get caught in a sticky situation without some basic planning and reconnaissance. All of these give a sensation if bigger, wider story without telling what it is, and that is intriguing. 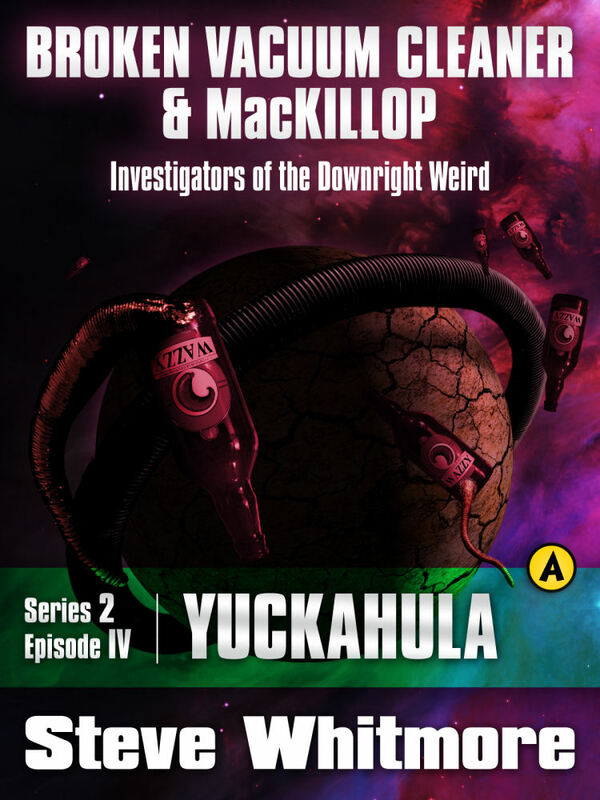 It pulls in interest, and the pace of the action, along with some pitch-perfect slapstick moments and the sheer, unadulterated viscerally nasty-but-wow-factor description of the alien slugs and their feeding habits keeps one enthralled. I had a bit of a think about that title. Yachahula. The closest to anything I came up with was that it sounds, when pronounced, very close to Yaaka Hula Hickey Dula. This was a ‘Hawaiian’ Love Song Written in 1915 and is a sort of patriarchal, white middle class idea of a word expressing the sound of a celebration in the ‘exotic’ location of Hawaii; a sort of ‘ta-daaah’! Maybe it is also the sound of gulping as performed by slithery alien slugs. Although the song writers in 1915 might not have been aware of this. Either way you poke at it, it also sounds a bit of a joke; a sound of paradise, warm beaches, relaxation and rum cocktails in a grimy, inner-city alien-infested downtown. Perhaps best to leave the ‘whys’ of such decisions to the man himself. AS Whitmore freely admits in his Amazon biography; “My fantasy comes bundled with plenty of width to make up for the absence of height. Shallow suburban stuff is where I'm at.” Yup, it is—and it’s funny. There is no point in over-analysing; this is pop-culture-referential, silly-macabre stuff. It slides snugly into the spoon of fantastical pulp fiction and goes down a treat. You can take it or leave it, and either way is just fine. Even better, I see he already has story number two out. For the record, it seems only fair to point out that this book is no longer free. As the author, I'm currently experimenting with price structures and from Sept 2012 this one is going for 99c.